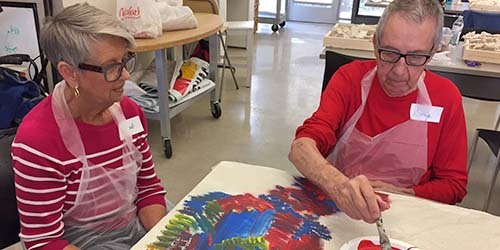 Arts in Mind offers arts engagements for individuals with mild to moderate dementia, to foster dignity and sense of self, as well as build connections with their care partner. No prior arts experience is necessary! Positive effect on physical, mental and social health. IS ARTS IN MIND FOR US? Does he or she primarily live at home? Has he or she been diagnosed with Alzheimer's or other dementia by a health-care professional? A difficulty with short-term memory, word-finding, and repetitive questions. A decline in ability to plan, organize or perform complex tasks such as managing finances or household chores or needing help with everyday tasks. Is he or she able to maintain focus and engage in a 90-minute program? Can he or she express thoughts and feelings in conversation? Is he or she comfortable in a group setting? Does he or she have a care partner with whom to attend the series? Are both of you available on weekday mornings or afternoons to attend all programs in a series? If you answered yes to all of these questions, Arts in Mind could be a great program for you and your loved one. REGISTER FOR ARTS IN MIND ENGAGEMENTS. New sessions continue through out the year! 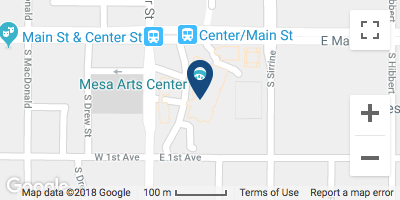 To learn more about our programs please contact our Engagement Staff at engagement@mesaartscenter.com or at 480-644-6540. There is NO fee for participation. Call early, as capacity is limited, but new sessions continue throughout the year! 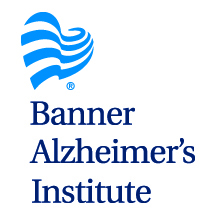 Developed in partnership with Banner Alzheimer's Institute.